2016 commemorates the 100th anniversary of the Easter Rising. Low edition limit – 30,000 worldwide. This medal pays tribute to a key figure of the Easter Rising. 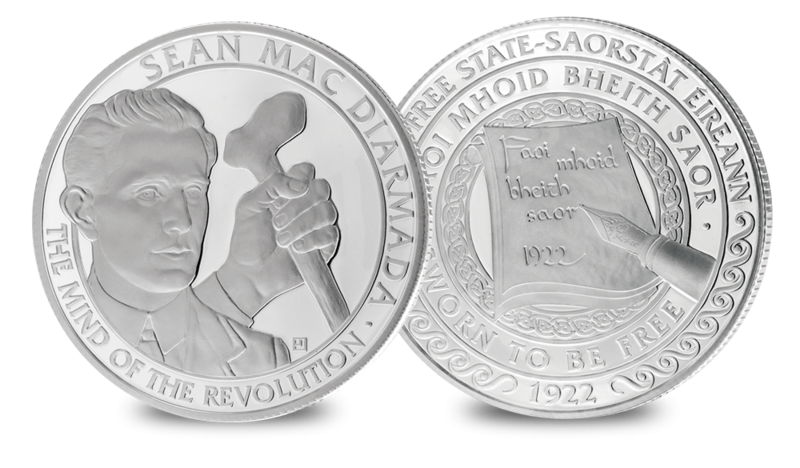 The Sean MacDiarmada medal is part of the seven signatories set which includes seven portraits of Irish Heroes. Each medal depicts the portrait of one of the Seven Signatories, together with their name and a fitting individual inscription. The commemoratives all share a common reverse design inspired by ‘Amhran na bhFiann’ (‘A Soldiers Song’), which was first coined during the Easter Rising and then adopted as the national anthem of the Irish Free State in 1926. Described by his biographer as ‘The mind of the revolution’, Sean MacDiarmada was an articulate, charismatic and politically astute figure who was in perpetually poor health. Struck with polio that left him paralysed down one side, he was a trusted point of contact between all of the organisations involved in the Easter Rising. Featured on the commemorative portrait of Sean MacDiarmada, who held his pride and defiance in the face of adversity, featured with his walking stick.